New Sepsis Alert System Relies On Algorithms And A Nurse's Wisdom : Shots - Health News A bedside computer loaded with software that tracks vital signs in the ICU can pick up early warning patterns, specialists say. But it takes a human care provider to sort the signal from the noise. 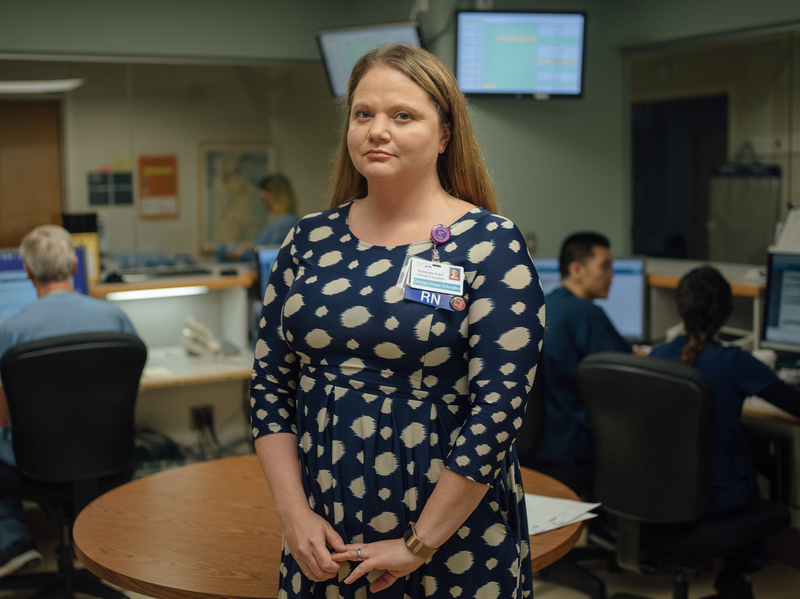 Rosemary Grant is a registered nurse and helps coordinate sepsis care at Harborview Medical Center in Seattle. The center's goal, she says, is to get a patient who might be developing sepsis antibiotics within three hours. A quarter of a million Americans die every year from sepsis, which is the body's reaction to overwhelming infection. This cascade of organ failure can be nipped in the bud if health care workers know it's ramping up, but that's often not easy to do. "Sepsis is a really frustrating disease," says Dr. David Carlbom, a critical care pulmonologist, and medical director of the sepsis program at the Harborview Medical Center in Seattle. "There's no blood test for sepsis," he says. "There's nothing you can look at under the microscope and say 'this is sepsis.' "
So a few years ago, Carlbom set out to devise a system that uses more subtle clues from a patient's day-to-day electronic health records to send up warning flags of impending sepsis. The automated system looks for patterns in symptoms like high temperature, low temperature, low blood pressure, fast breathing and high white-blood-cell counts. No single symptom signals sepsis, but certain patterns suggest this condition could be emerging. Rosemary Grant, a registered nurse who coordinates sepsis care at Harborview, explains how it works as we stand at a nursing station in the hospital. The previous day, a red box appeared on a computer screen next to the name of a patient who had been hospitalized for several weeks following a motorcycle accident. The computer prompted the nurse responsible for that patient to assess whether his constellation of symptoms was an early sign of sepsis. "If the nurse says yes, then the provider is automatically paged, out of the computer system," Grant says. The doctor is supposed to respond within half an hour, she says, and the overall goal is to get a patient who might be developing sepsis antibiotics within three hours. But faster breathing might also be due to a walk down the corridor, and having an elevated number of white blood cells is not a reliable sepsis indicator in someone with cancer. Given the general nature of these symptoms, most of the time the nurse will report that the alert is just a false alarm. Once one alarm is triggered, nurses aren't notified again for 12 hours, Grant adds — and that helps reduce the number of annoying false alarms the hospital staff must handle. If the nurse says it's not sepsis, Grant says, "then the computer system just asks 'why do you think the patient has these abnormal vital signs?' "
The nurse may type in that the patient's heart rate was up because he was exercising, or has a high pulse because she's in pain. It's a partnership between the automation and the human being. And while systems like this are increasingly common in hospitals, the synergy between nurses and computers is a hallmark of the Seattle program. "Just having the nurses really being in tune with their patients is really what makes the system work," Grant says. And it is working, she says. Since the system was installed in 2011 — and updated in 2017 — hospital mortality has fallen. We head over to the room of the injured 34-year-old motorcyclist to see how he's doing. Matthew Clark says his world changed on Jan. 15, when he had an unfortunate encounter with a car. "I was just on the way to make some chicken chili for my girlfriend," he says, "and a young distracted driver who wasn't looking kind of plowed into me." Two big bones in his left leg were broken, requiring a series of operations to set right. But nine days after the accident, Clark got a clue his recovery was taking a turn for the worse when a friend came into his hospital room and he had trouble waving to her. "I noticed my hands were shaking," he says, "and my blood started to leave my hands and feet. I just looked at her and said 'I need some help.' "
The hospital's internal 911 system responded with a team that, among other things, provided intravenous antibiotics to prevent his apparent infection from raging out of control and becoming septic shock. "My temperature dropped incredibly," he says. "I'd never been so cold or shook so hard in my life." And 24 hours later, he says, he was back to his old self. In this case, the patient's alert actually popped up on the computer screen long after the medical team had stepped in. 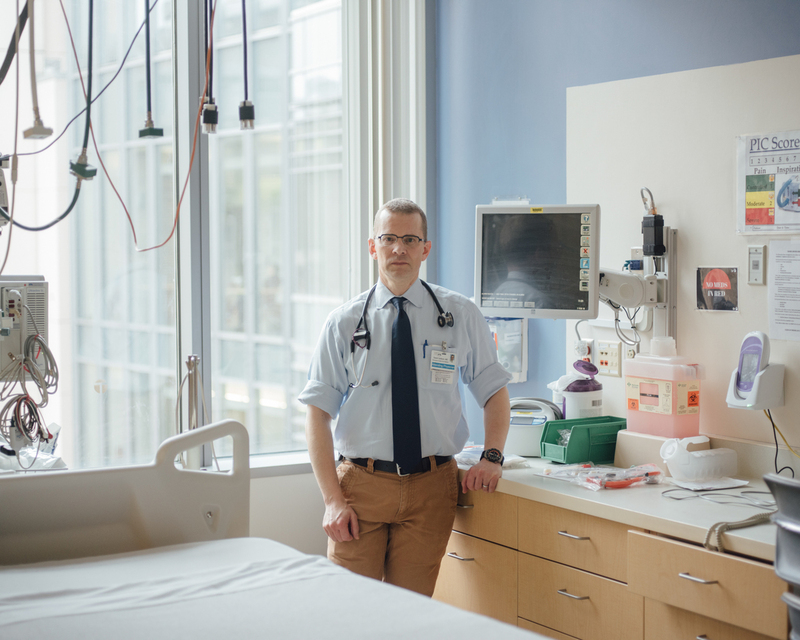 Dr. David Carlbom, a critical care pulmonologist at UW Medicine's Harborview Medical Center, says sepsis has long frustrated clinicians. "There's no blood test," he says. "There's nothing you can look at under the microscope and say 'this is sepsis.' "
"I think his case is a great example of action happening before the computer catches up," Carlbom says. "The vital signs are measured and dealt with at the bedside before they're entered into the computer." (This alert also turned out to be a false alarm – Clark later found out his shock wasn't caused by sepsis). In fact, that need to enter vital signs manually into the electronic medical record is a shortcoming of this system. The computer may be ever vigilant for signs of infection, but it only gets new data to crunch a few times a day. This isn't simply an issue for the system at Harborview — it's a shortcoming for automated sepsis-detection programs elsewhere. Medical researchers are actively working to close that gap, says Dr. Matthew Churpek at the University of Chicago. "We're partnering now with a company that has a device that goes under a patient's mattress and can continuously calculate their heart rate and respiratory rate in real time," Churpek says. His team and others are also working on more accurate computer algorithms, to reduce the number of false alarms that are a problem both in Seattle and in similar systems around the country. Doctors have struggled to find a good treatment for sepsis. For example, last year Dr. Paul Marik announced that a protocol involving intravenous vitamin C, thiamine and steroids dramatically reduced the number of sepsis deaths in his hospital's intensive care unit in Norfolk, Va. That unproven treatment has just begun to be studied in a series of careful clinical trials. Carlbom uses that experimental therapy sometimes, but says it would be much better to prevent the condition. "We use all these therapies in the ICU as a rescue tool when people are very sick dying of septic shock," he says, "but I think early discovery will probably affect mortality more." You can contact Richard Harris via email: rharris@npr.org.